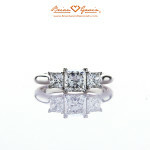 Let’s begin with a better understanding of the differences between an Internally Flawless and VVS-1 clarity diamond. The grading criteria for determining whether a diamond is “internally flawless” is that there not be any inclusions visible under 10x magnification, which is the industry standard for diamond grading. Minor blemishes may be present on the surface of the diamond. This is why you’ll see the comment “minor details of finish are not shown” (on the plotting diagram) on the lab report. So, this 1.02 carat, D-color, Internally Flawless, Brian Gavin Signature hearts and arrows diamond (pictured above) has no inclusions visible at 10x magnification. However, minor inclusions might be visible if the diamond is viewed using a higher degree of magnification, such as 30x, 40x, 50x, or higher. For example, it might be possible to find a pinpoint size diamond crystal, or something like that, at a higher degree of magnification. But the inclusion is not visible at 10x, and thus, the diamond is graded as internally flawless. We don’t have images for the 1.02 clarity, E-color, VVS-1 clarity, Advance Ideal cut diamond yet, because it is currently in-production (more on that in a minute). So, we’re going to use the clarity photograph for this 1.058 carat, G-color, VVS-1 clarity, Brian Gavin Signature hearts and arrows diamond. 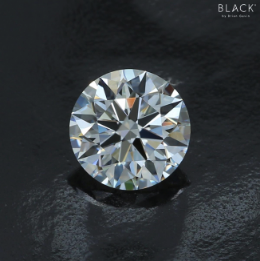 By definition, a VVS-1 clarity diamond contains inclusions that are so slight, that they are difficult for a skilled grader to see using 10x magnification. 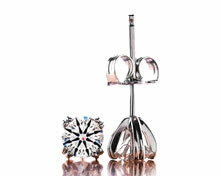 The abbreviation “VVS-1” means that the diamond is Very, Very Slightly (included) at the highest level, which is one. So, the difference between VVS-1 and Internally Flawless is the visibility of the inclusions. The important thing to realize is that the difference between a diamond which is Internally Flawless and VVS-1 in clarity, will only be visible while examining the diamond using 10x magnification. Even then, most people will be hard-pressed to find the inclusions within a VVS-1 clarity diamond using only 10x magnification. After all, the inclusions are very, very slight. How Much Does a VVS-1 Clarity Diamond Cost (compared to IF clarity)? 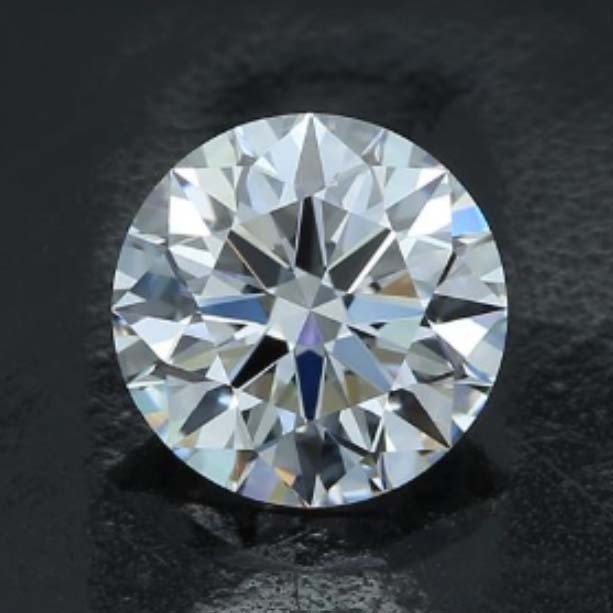 As you can see from the screenshot above, the 1.02 carat, E-color, VVS-1 clarity, Advance Ideal cut diamond is currently selling for $14,073.00 which will be discounted to $13,651.00 for payment via cash/wire transfer. The 1.02 carat, D-color, Internally Flawless (IF) clarity, Brian Gavin Signature hearts and arrows diamond is currently selling for $23,696.00 which will be discounted to $22,985.00 for payment via cash/wire transfer. 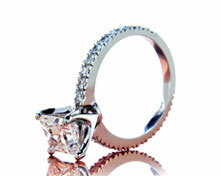 The 1.02 carat, E-color, VVS-1 clarity, Advance Ideal cut diamond costs less for several reasons. To begin with, the diamond is one color grade, and one clarity grade lower. The diamond would cost considerably more if it were a D-color, VVS-1 clarity, super ideal cut diamond. However, the E-color, VVS-1 clarity diamond is also a little less expensive because it’s an Advance Ideal that is currently in-production. We offer Advance Ideal cut diamonds at a slight discount, because we have not yet incurred inventory flooring costs. What is an Advance Ideal Cut Diamond? People frequently ask what is an advance ideal cut diamond, because it is a term exclusive to Brian Gavin. As a fifth-generation diamond cutter, Brian Gavin always has diamonds in-production. Historically, we’ve always made the list of those diamonds which are in-production at the factory, available to our wholesale accounts. Recently, we decided to make the list of Brian Gavin Signature hearts and arrows diamonds which are in-production, available to our clients, so that you have more diamonds to choose from. Advance Ideal cut diamonds will be polished to the strict standards of the Brian Gavin Signature brand of hearts and arrows diamonds. Which means that the only difference between an Advance Ideal and a Brian Gavin Signature Diamond is that the Advance Ideal cut diamonds are still in-production. 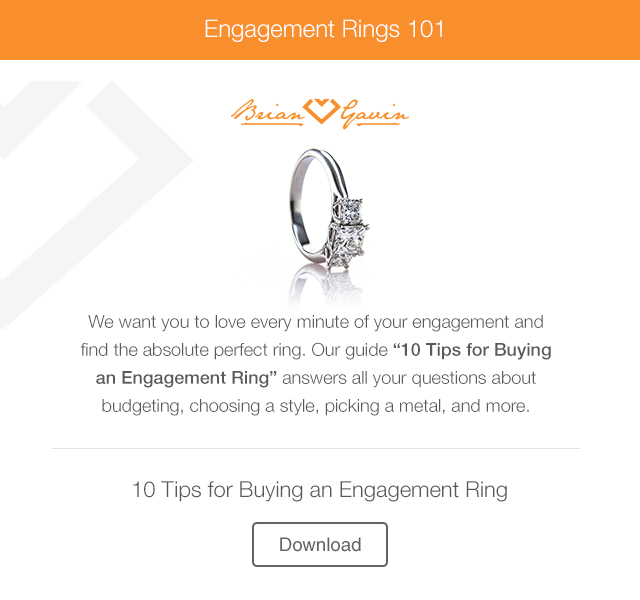 As such, it is important to realize that the measurements and proportions stated on the diamond details page for Brian Gavin Advance Ideal cut diamonds is an educated projection, but they are not absolute. This is because we use state-of-the-art diamond scanning technology to predict the outcome, but there might be slight differences in the actual proportions when the polishing process is complete. 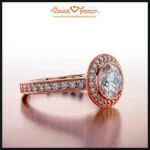 At the same time, you should know, that all Brian Gavin Signature hearts and arrows diamonds are cut to a precise and limited range of proportions, so the measurements will not be that different. We always aim for the middle of the spectrum, known as the sweet spot, when cutting diamonds for our brand. 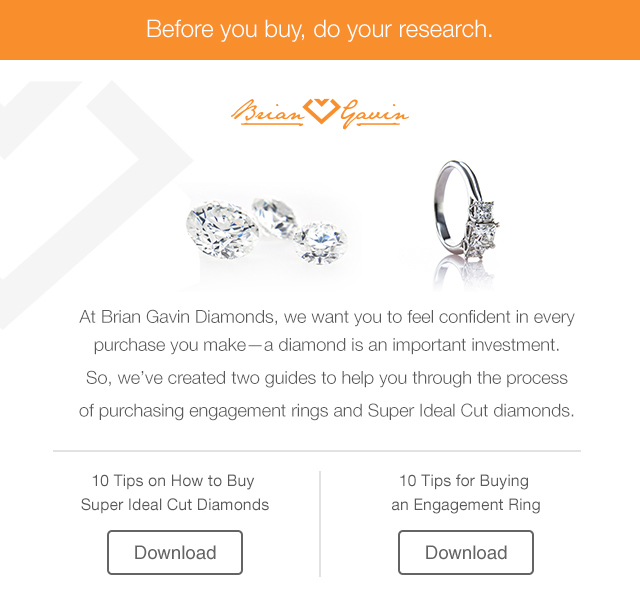 Another question that people frequently ask, is whether Brian Gavin Advance Ideal cut diamonds are guaranteed the same as Brian Gavin Signature diamonds. Per the terms on our website, Advance Ideal cut diamonds are covered by our 15-day inspection period with a full money back guarantee less the cost of original shipping (which is included). 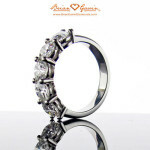 Upon completion of the cutting process, your Brian Gavin Advance Ideal cut diamond will be sent to the American Gem Society Laboratory (AGSL) where it will be graded on their proprietary Light Performance grading platform which uses Angular Spectrum Evaluation Technology (ASET) to ensure that your diamond exhibits the highest degree of light return. Then the diamond will be sent back to Brian Gavin Diamonds where it will be re-inspected, and photographed under a variety of reflector scopes, so that you can see how it performs under ASET, Ideal Scope, and a Hearts & Arrows Scope. If the diamond does not meet our selection criteria for any reason, Brian Gavin will reject the diamond and offer you a comparable alternative, which you can decide to accept, or request a full refund at that time. 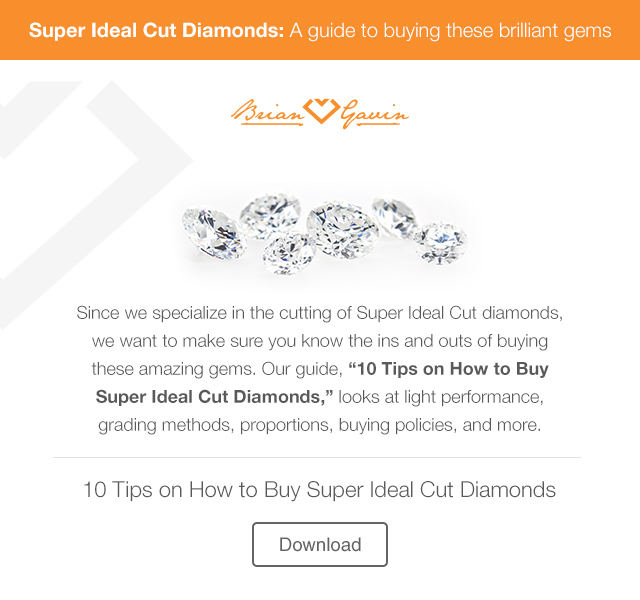 With all of this in mind, I’m certain you will agree, that Brian Gavin Advance Ideal cut diamonds offer an incredible opportunity because they provide you with an expansive inventory of additional diamonds to consider, and a nice discount because we don’t have to pay flooring costs. It’s a win/win for everybody involved. This entry was written by Danny, posted on August 1 at 8:33 am, filed under Diamond Education. Bookmark the permalink. Follow any comments here with the RSS feed for this post. Trackbacks are closed, but you can post a comment.